“Ojai is special. There is no fight with new music. There is no fear. Just curiosity and hunger for fresh music of today. The Ojai audiences are completely open minded, and it’s a wonderful possibility to do music that I truly enjoy and find powerfully relevant in our present world. Ojai is magic,” Patricia Kopatchinskaja, 2018 Music Director. (OJAI CA – UPDATE May 24, 2018) – The 72nd Ojai Music Festival, June 7-10, 2018, presents Music Director Patricia Kopatchinskaja’s unbounded musical creativity in the context of today’s social and political climate. The Ojai, Ventura, and Santa Barbara areas continue to replenish from the devastation of the Thomas Fire. The Topa Topa Mountains surrounding the Ojai Valley have already given rise to new growth, and the Festival honors this renewal with new works, debuts, and free community concerts. “When I first met Patricia Kopatchinskaja, I knew she was a natural to be Music Director of the Festival. She is, quite simply, a force of nature. Her unstoppable energy, blazing virtuosity, and relentless curiosity are irresistible. The 2018 Festival will showcase her wildly diverse artistic tal-ents as a violinist, a collaborator, a director, an advocate, and as a creative force. Patricia sees music in the context of today’s social and political issues, so the 2018 Festival is one that will surely offer confrontation, questioning, and healing. The 2018 Festival aims to capture Patricia’s infectious energy and virtuosity,” said Artistic Director Thomas W. Morris. The 2018 Ojai Music Festival welcomes the Mahler Chamber Orchestra (MCO) in its first extended United States residency. Founded in 1997, the Berlin-based MCO defines itself as a free and international ensemble, dedicated to creating and sharing exceptional experiences in classical music. With members spanning 20 different countries, the MCO works as a nomadic collec-tive of passionate musicians uniting for specific projects in Europe and across the world. The MCO forms the basis of the Lucerne Festival Orchestra and maintains long and fruitful artistic relationships with major artists, including Ms. Kopatchinskaja and Mitsuko Uchida, Ojai’s 2021 Music Director. In Ojai, MCO will display its versatility and virtuosity as an orchestral ensemble, in smaller chamber iterations, and also in superb solo performances from individual members. The JACK Quartet also makes its Ojai debut at the 2018 Festival. Deemed “superheroes of the new music world” (Boston Globe), JACK is dedicated to the performance, commissioning, and spread of new string quartet music. Comprising violinists Christopher Otto and Austin Wulliman, violist John Pickford Richards, and cellist Jay Campbell, the group collaborates with composers of our day, including John Luther Adams, Chaya Czernowin, Simon Steen-Andersen, Caroline Shaw, Helmut Lachenmann, Steve Reich, Matthias Pintscher, and John Zorn. At the 2018 Festival, JACK will perform works by Georg Frederick Haas, Horatio Radulescu, Morton Feldman, George Crumb, and John Luther Adams. Major projects will include two semi-staged concerts conceived and directed by Ms. Kopatchinskaja. The first, which opens the Festival on Thursday night, is Bye Bye Beethoven. Ms. Kopatchinskaja describes the concert as a commentary on “the irrelevance of the classic concert routine for our present life.” This program features a mash-up of music by Charles Ives, John Cage, Joseph Haydn, György Kurtág, Johann Sebastian Bach, and the Beethoven Violin Concerto. This marks the US premiere of Bye Bye Beethoven, which was premiered at the Hamburg International Music Festival and subsequently staged in Berlin. This production marked the fourth collaboration between Ms. Kopatchinskaja and the Mahler Chamber Orchestra. Bye Bye Beethoven involves musicians in both conventional and unconventional roles, encounters with different musical genres and discourse among sound, space and imagery. The second semi-staged concert conceived and directed by Ms. Kopatchinskaja is a provocative commentary on the consequences of global warming. Titled Dies Irae, the program is an aesthetic reflection of a time rife with global warming, wars over resources, and refugee crises. Musical selections include Heinrich Ignaz Franz Biber, George Crumb, Michael Hersch, Byzantine chant, and Galina Ustvolskaya’s remarkable Dies irae for eight double basses, piano, and wooden box. The evening performance on Saturday, June 9 marks its American premiere. A new work, I hope we get a chance to visit soon by American composer Michael Hersch – described by him as a dramatic narrative for two sopranos and eight instrumentalists – will receive its world premiere at the 2018 Ojai Music Festival, with subsequent performances at Cal Performances’ Ojai at Berkeley and at Great Britain’s venerable Aldeburgh Festival. Performing in the premiere will be sopranos Ah Young Hong and Kiera Duffy, alto saxophone player Gary Lou-ie, and members of the Mahler Chamber Orchestra conducted by Tito Munoz. Set to poetry and text by Rebecca Elson, Mary Harris O’Reilly, and Christopher Middleton, the new work is com-missioned by the Ojai Music Festival, Cal Performances Berkeley, Aldeburgh Festival, and PN Review. Mr. Hersch, who wrote a violin concerto for Ms. Kopatchinskaja two years ago, is con-sidered one of the most gifted composers of his generation. He currently serves on the composi-tion faculty at the Peabody Institute of the Johns Hopkins University. The Friday, June 8 premiere follows works by Carl Philip Emmanuel Bach, and music by Purcell, Bartok, Shostakovich, and George Crumb performed by Anthony Romaniuk, Patricia Kopatchinskaja, and JACK Quartet. Featured on Friday afternoon (June 8) will be the music of Russian composer Galina Ustvolskaya, described by Alex Ross as “one of the century’s grand originals.” Kopatchinskaja has long been a passionate advocate of Ustvolskaya’s music and will perform her Duet and So-nata with pianist Markus Hinterhäuser. Hinterhäuser, who is also the Intendant of the Salzburg Festival, will perform all six of her piano sonatas. Ustvolskaya’s powerful Dies irae will be featured in the Saturday evening concert of the same title. Additional programming highlights include Kurtag’s Kafka Fragments; Stravinsky’s L’Histoire du Soldat on the occasion of its centennial; major chamber and piano music by Galina Ustvolskaya; as well as Romanian and Moldavan folk music performed by Ms. Kopatchinskaja and her parents, Viktor and Emilia Kopatchinsky on cimbalom and violin. The Festival closes with the Ligeti Violin Concerto performed by Patricia Kopatchinskaja. The 2018 Festival continues to build on its commitment to reach broader audiences with several opportunities for all to experience Ojai offerings. On Thursday June 7, following the three-part Ojai Talks dialogues, the Festival commences the first in a series of five free concerts in the Gazebo of Libbey Park, featuring performances of Luciano Berio’s Sequenzas for solo instruments performed by members of the Mahler Chamber Orchestra. On Saturday morning (June 9), Viktor Koptachinsky will perform in works for cimbalon at the Gazebo hosted by his daughter Patricia and Artistic Director Thomas W. Morris. Ms. Kopatchinskaja and Scott Worthington, electronics (who replaces Jorge Chiong-Sanchez), will perform Luigi Nono’s La lontanaza nostalgica utopia futura in a free concert on Thursday evening in Libbey Park, preceding the Festival’s first main Libbey Bowl concert of Ms. Kopatchinskaja’s semi-staged concert Bye Bye Beethoven. New to the schedule is on Friday evening (June 8), the JACK Quartet will perform John Luther Adams’ Everything that Rises, a work commissioned by the quartet, in a free community concert in tribute to the Ojai Valley renewal following December’s devastating wild fires. Additionally, Ms. Kopatchinskaja has programmed two free concerts just for children. Children of all ages will convene in the Ojai Art Center listen to works by Berio, Biber, Cage, Holliger, Arthur Honegger, and Ferdinand the Bull by Alan Ridout for solo violin and speaker. These concerts for children are presented in association with the Festival’s BRAVO education program for schools and community. The 2018 Festival begins with Ojai Talks hosted by Ara Guzelimian, former Festival Artistic Director and current Dean and Provost of The Julliard School. On Thursday, June 7, a three-part series of discussions will begin with an exploration of Patricia Kopatchinskaja’s musical preferences and inspirations, followed by a discussion with composer Michael Hersch and soprano Ah Young Hong. The third part of the series will speak to the reinvention of musical groups with the JACK Quartet. Additional on-site and on-line dialogue during the 2018 Festival includes Concert Insights, the preconcert talks at the LIbbey Bowl Tennis Courts with Festival artists hosted by resident musicologist Christoper Hailey, and live stream interviews between concerts. For up-to-date Festival information, artist biographies and photos, and access to concerts, etc., visit the Ojai Music Festival website at OjaiFestival.org. 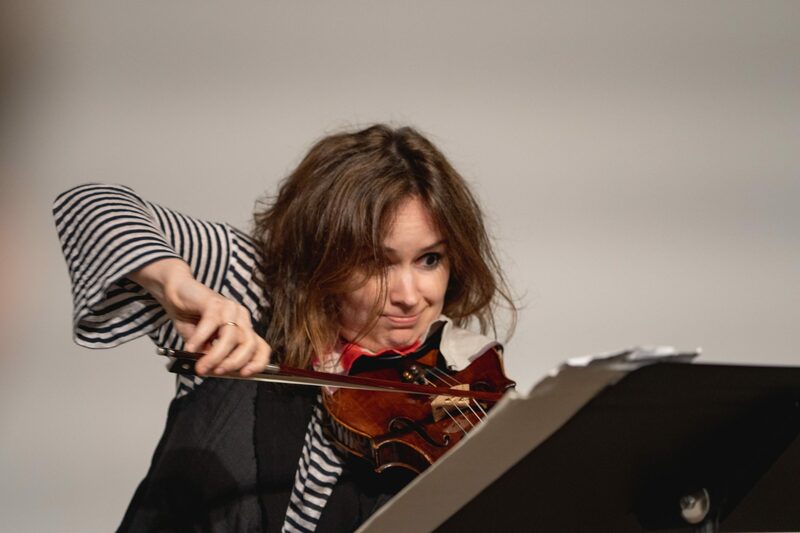 Following the 2018 Festival in Ojai with Music Director Patricia Kopatchinskaja and the following week’s Ojai at Berkeley presented in collaboration with Cal Performances, a new partnership with Aldeburgh will take place at the end of the Aldeburgh Festival (June 20 – 23) based at the acclaimed Maltings Concert Hall and in the town of Snape near Aldeburgh in England. The col-laboration with Aldeburgh follows the formation of Ojai at Berkeley as a partnership of co-productions and co-commissions that affords the Ojai Music Festival, the Aldeburgh Festival, and Cal Performances the ability to present more complex and creative artistic projects than could be conceived by each partner separately. The Aldeburgh relationship launches in June 2018, for an initial four-year period. Marking the eighth year of artistic partnership, Ojai at Berkeley celebrates the dynamic nature of the Ojai Music Festival and of Cal Performances. As two distinct communities, Ojai and Berke-ley are both known for intrepid artistic discovery, spirited intellect, and enduring engagement in the arts. Inaugurated in 2011, Ojai at Berkeley is a joint force that enables co-commissions and co-productions and allows artists to achieve more than could be imagined by each organization separately. Ojai at Berkeley will take place from June 15-17 in Berkeley, CA, following the Ojai Music Festival. For more information, visit CalPerformances.org. Ms. Kopatchinskaja’s (Ko pat chin sky yah) 2017/18 season commenced with the world premi-ere of her new project Dies Irae at the Lucerne Festival where she was ‘artiste étoile’. The second staged program which follows the success of Bye Bye Beethoven with Mahler Chamber Orchestra in 2016, is conceptualized using a theme from the Latin Requiem Mass and features music from composers such as Scelsi, Biber and Ustwolskaja. The North American premiere will take place at the Ojai Festival in June 2018 where she is Music Director. Ms. Kopatchinskaja’s was awarded the prestigious Swiss Grand Award for Music in September 2017 and continues to move from strength to strength adding a Grammy award to her list of ac-colades in the 17/18 Season. The Violinist was presented with the award for Best Chamber Mu-sic/Small Ensemble Performance for her disc Death and the Maiden, recorded with the St Paul Chamber Orchestra and released on Alpha Classics. Concert highlights in 17/18 include; performances of Stravinsky’s concerto with Currentzis and the Tonhalle-Orchester Zürich and the same repertoire with Gimeno and the Rotterdam Phil-harmonic Orchestra. 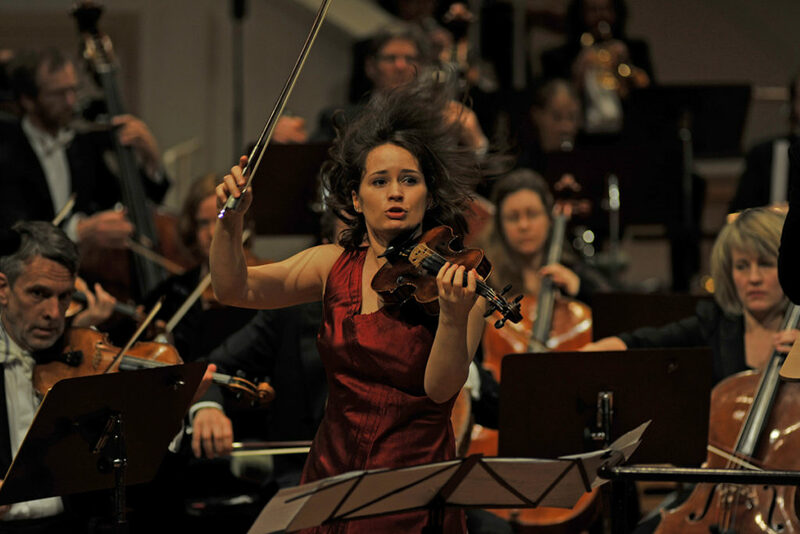 She has played with Mahler Chamber Orchestra under Payare and will perform with Orchestra Sinfonica Nazionale della RAI and Geneva Camerata for Berg’s violin concerto. Chamber music is immensely important to Ms. Kopatchinskaja and she performs regularly with artists such as Markus Hinterhäuser, Anthony Romaniuk and Jay Campbell. With pianist, Polina Leschenko she has recorded and released ‘Deux’ for Alpha Classics. Together the duo reimagi-nes the sonatas of Ravel, Poulenc, Bartok and Dohnányi. Thomas W. Morris was appointed Artistic Director of the Ojai Music Festival starting with the 2004 Festival. As Artistic Director, he is responsible for artistic planning and each year appoints a music director with whom shapes the Festival’s programming. During Mr. Morris’ tenure, audi-ences have increased, the scope and density of the Festival has expanded, the collaborative partnership Ojai at Berkeley with Cal Performances at UC Berkeley has started, a new partner-ship with England’s Aldeburgh Festival will be initiated this year, and a comprehensive program of video streaming of all concerts has been instituted. Mr. Morris is recognized as one of the most innovative leaders in the orchestra industry and served as the long-time chief executive of both The Cleveland Orchestra and the Boston Symphony Orchestra. He is currently active na-tionally and internationally as a consultant, lecturer, teacher, and writer. Mr. Morris was a found-ing director of Spring for Music and served as the project’s artistic director. He is currently vice chair of the Board of Directors of the Interlochen Center for the Arts, and he is also an accom-plished percussionist. In November, Mr. Morris announced his decision to retire as the Festival’s Artistic Director following the 2019 Festival with Music Director Barbara Hannigan, after shaping Ojai’s artistic direction for sixteen years. From its founding in 1947, the Ojai Music Festival has created a place for groundbreaking musi-cal experiences, bringing together innovative artists and curious audiences in an intimate, idyllic setting 80 miles northwest of Los Angeles. The Festival presents broad-ranging programs in unu-sual ways with an eclectic mix of rarely performed music, refreshing juxtapositions of musical styles, and works by today’s composers. The four-day festival is an immersive experience with concerts, free community events, symposia, and gatherings. Considered a highlight of the inter-national music summer season, Ojai has remained a leader in the classical music landscape for seven decades. Through its unique structure of the Artistic Director appointing an annual Music Director, Ojai has presented a “who’s who” of music including Aaron Copland, Igor Stravinsky, Olivier Messiaen, Michael Tilson Thomas, Kent Nagano, Pierre Boulez, John Adams, Esa-Pekka Salonen, Robert Spano, Pierre-Laurent Aimard, David Robertson, Eighth Blackbird, George Benjamin, Dawn Upshaw, Leif Ove Andsnes, Mark Morris, Jeremy Denk, Steven Schick, Peter Sellars, and Vijay Iyer. Following Patricia Kopatchinskaja, Ojai will welcome Music Director Barbara Hannigan (2019), Matthias Pintscher (2020) and Mitsuko Uchida (2021). As the Ojai Music Festival approaches its 75th anniversary and looks toward the future with re-cently appointed Artistic Director Chad Smith, who will take the helm in 2020, the innumerable contributions by Thomas W. Morris will continue to be realized through the 2019 Festival and be-yond. Under Mr. Morris’ creative watch, the Festival continues to push boundaries and scope; explore each music director’s individual perspective, creativity, and artistic communities; invite an ever-broadening roster of artists; and build connections across musical communities with through-curated programming for each Festival. The Ojai Music Festival continues to draw thousands of curious and engaged music enthusiasts from across the country. As tickets remain in high demand, Ojai includes free access to the Fes-tival experience through live and archived video streaming at OjaiFestival.org. The live streaming includes guest interviews throughout the web cast. Hosting this year will be director of publications at National Sawdust and longtime journalist Steve Smith and LA-based composer/musician and host of Underscore.FM podcast Thomas Kotcheff. 2018 Festival single tickets are available and may be purchased online at OjaiFestival.org or by calling (805) 646-2053. 2018 Ojai Music Festival single tickets range from $45 to $150 for re-served seating and lawn tickets for $20.